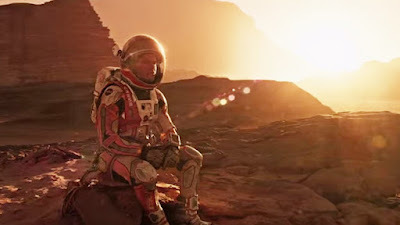 Two years ago around this time we had Alfonso Cuarón’s GRAVITY, last year there was Christopher Nolan’s INTERSTELLAR, and now there’s this year’s cerebral sci-fi fall release about astronauts struggling for survival in space, Ridley Scott’s THE MARTIAN, an adaptation of the 2011 bestseller by Andrew Weir that I never got around to reading. And with the news that they just found water on Mars, it couldn’t be more timely. Set in the near future, the film stars Matt Damon as Mark Watney, a NASA Astronaut who is left behind by mistake on Mars when the crew of the Ares 3 mission are forced to evacuate during a dangerous dust storm. In the chaos, Damon’s Watney is impaled by flying debris and sent flying off into the distance, leaving his team members to believe that he’s dead. Meanwhile back on earth, NASA scientists and officials, including Chiwetel Ejiofor as Director of Mars Mission, Jeff Daniels as the head of NASA, Kristen Wiig as NASA’s head of public relations, and Sean Bean as the flight director, find out that Watney is still alive and they attempt to do the math, with the help of Donald Glover as a awkward scruffy astrodynamicist, and unravel the red tape needed to get him back. Oh, and the NASA brain trust struggles with whether or not to tell the returning crew headed by Jessica Chastain, who, guilt-stricken at leaving behind her fellow colleague, would surely go against orders to turn her ship around to go back and try to save him if she knew. Also on board with Chastain are Kate Mara, Michael Peña, Sebastian Stan, and Aksel Hennie, who each have their moments and add to the film’s driving force of humanity. Despite the stakes, which do carry considerable weight, this is one of Scott’s sunniest and most fun films. Especially when compared to his last space epic, the ALIEN prequel PROMETHEUS, which I found more grueling than a good time. Sure, there shades of many movies in play here from APOLLO 13 to CASTAWAY; from the aforementioned GRAVITY to 127 HOURS and so on, but THE MARTIAN never feels derivative. Drew Goddard’s tightly scripted structure smoothes out the tropes into a thoroughly engaging, and consistently gripping narrative. 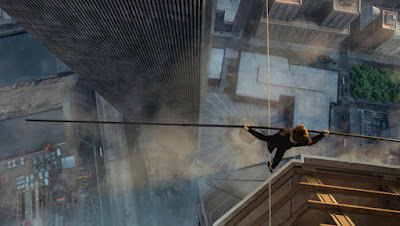 It’s also the second film I’ve seen this week that well utilized the 3D format – THE WALK was the other. THE MARTIAN and THE WALK, which both open this week, are also alike in that they are inspirational epics that were immaculately shot by the same cinematographer, Dariusz Wolski. I’ll be shocked if Wolski doesn’t take home an Oscar next year for one of these visual feasts. It’s so nice to be back in the ‘movies are getting good again’ season, with such a marvelously gripping movie as THE MARTIAN heading the herd. Just don’t be dissing on Damon so hard that you miss it.